Reason number 137 why I LOVE my bread machine..... I can make Cinnamon Rolls in it!!! No more wearing out my elbow with stiring the dough. No more wearing out my wrist with kneading the dough. No more waiting while the dough rises and punching it down. With this recipe my bread machine does all the work for me and all I have to do is pour in the ingredients, push a button and go spend time with our little MacchiOTTo which I'd much rather be doing anyway. Simply pour these ingredients into the pan of the bread machine in this order: 1 cup milk (110 degrees), 2 eggs, 1/3 cup margarine (melted), 4 1/2 cups bread flour, 1 tsp. salt, 1/2 cup sugar, 2 1/2 tsp. bread machine yeast. Place machine on dough setting. Once complete turn onto a floured surface and roll dough into a 16 x 21 rectangle. Then melt 1/3 cup butter and spread over entire dough. The sprinkle 2 1/2 T. Cinnamon and 1 cup brown sugar over butter. 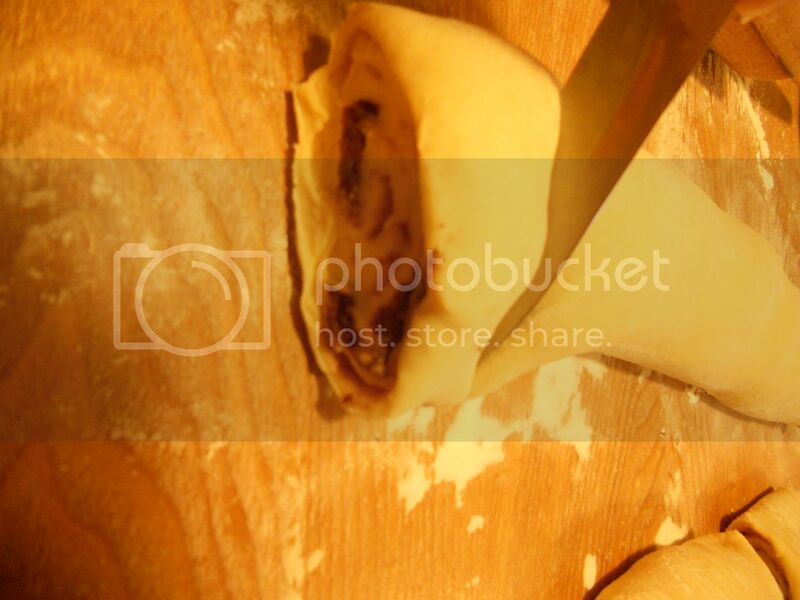 Roll up dough and cut in 1 1/2 inch rolls with a knife. Place rolls in a greased 9 x 13 pan, cover and let rise for 30 minutes. Bake at 400 degrees for 15 minutes or until they just start to brown. Spread frosting over rolls and serve. Frosting ingredients: 1 (3 oz) package of cream cheese, softened, 1/4 cup butter, melted, 1 1/2 cup. confectioners sugar, 1/2 tsp. vanilla, 1/8 tsp. salt. Mix together and pour over hot rolls. These rolls taste great and what you don't eat the first morning, you can pop in the microwave for 30 seconds the next day and they still taste like they are fresh out of the oven. Those cinnamon rolls look awesome!! I can't wait to try them with my bread machine! Thanks for sharing the recipe and linking to Tempt My Tummy Tuesday. 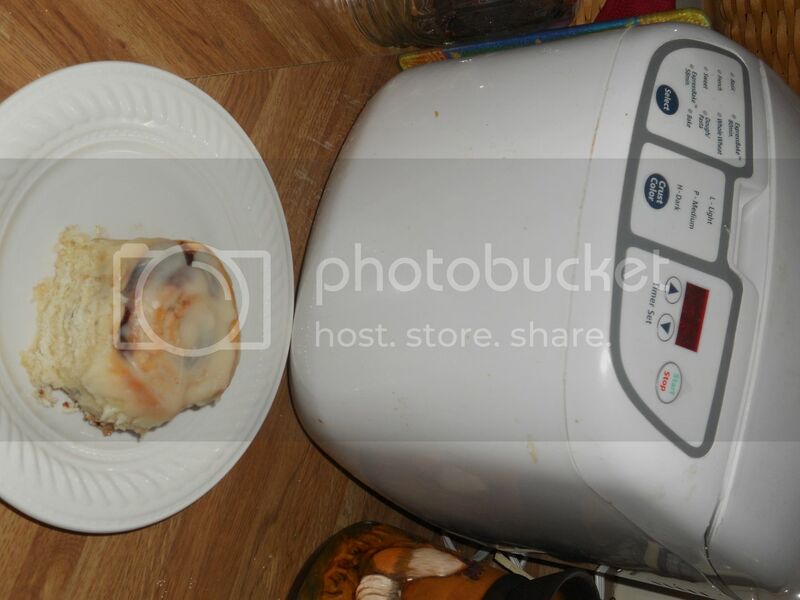 Your cinnamon rolls really do look so delicious! I love how quick and easy they are too - what a wonderful treat! Yum! Being so hard to make is one of the reasons why I never make homemade cinnamon rolls. I cant wait to try this in my bread machine. I have this same model bread machine. :-) Can this recipe be adjusted at all with oj to make sweet orange rolls?